Roll on their 1980 album “Remain In Light.” It’s very difficult to for a band to match and album that you consider to be outstanding so I won’t make comparisons to “77,” especially as this album was a change in direction from their traditional punk sound to a more funky direction. I hear some reggae influence in the opening tracks, “Born Under the Punches” and “Crosseyed and Painless.” They are good songs and what really makes them for me is the humourous approach that David Byrne takes to not just these two songs but for the entire album. It is definitely evident in the album’s big single, “Once in a Lifetime.” However, it is this sense of humour that makes me listen more to the lyrics and gets me thinking. Then there are some interesting musical effects, especially in the closer “The Overload” and “Houses In Motion” is very effective too. I get the impression that the band had a rather good time in making this album. 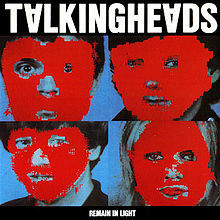 “Remain in Light” would go on to be considered one of the best albums of 1980, if not the entire decade by many critics. I don’t debate it. This album provided people with something different at a time when there was mainly hard rock and disco. Fortunately the latter was dying a death. “Remain in Light” highlights the abilities of four very talented musicians and even after all these years, I consider it to be way out there and I like that. This entry was posted on September 23, 2013 at 6:11 pm and is filed under 1980s, Humour, Music, Rock, Uncategorized with tags Classic Rock, punk, reggae, Remain in Light, Talking Heads, The 1970s, The 1980s. You can follow any responses to this entry through the RSS 2.0 feed. You can leave a response, or trackback from your own site. Definitely a great album which I didn’t fully get into until I revisited their catalog for my blog 2-1/2 years ago. It’s hard to compare it to “77” since they were separated by a few years and a couple of albums, but Talking Heads came out of the gate with at least 4 classic albums (and one under-appreciated live album). I love Adrian Belew’s contributions to this album, especially the squealing guitar in “The Great Curve.” If I had any complaint about Remain In Light it’s the fact that the first half is stronger than the second half, but it’s grown on me with each listen. Excellent post highlighting a somewhat forgotten album with an excellent cover image. Wow, I knew Adrian Belew contributed on the album but I never realised he did the squeal. He is a brilliant underrated guitarist. I kind of agree with you, the first half seemed stronger than the second but I found the second half to be alright as well. Very true, my idea of punk will be brought up in the next post. Cool album. I found my way these guys via enjoying Adrian Belew’s playing but I could really do with getting to know it better.